We joined forces with the guys from BrewDog Leeds to collaborate on this beer, which launched as a limited edition special during their CollabFest festivities across all of their UK bars. 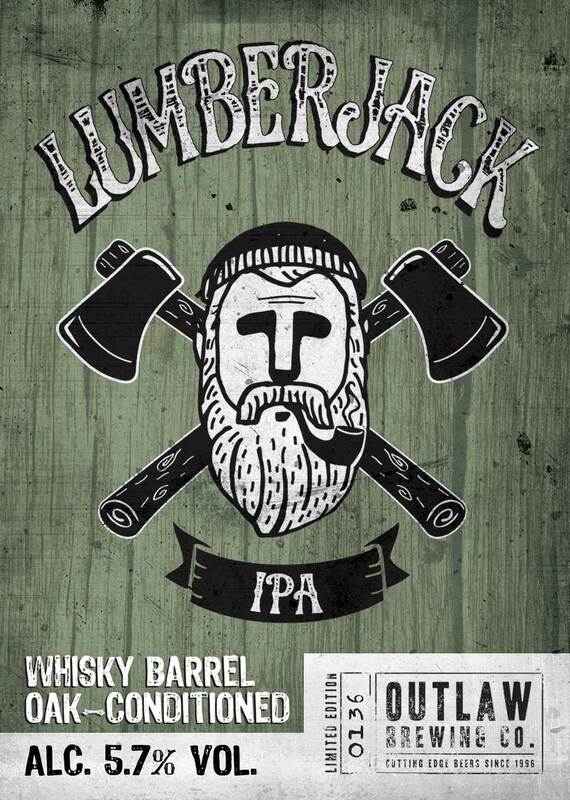 A blend of five malts combine to create a pale amber IPA that’s been brewed using Pacific Gem, Cascade and Galaxy hops, before being conditioned on oak from a Glen Garioch whisky barrel. The beer has been dry-hopped with Amarillo for good measure, creating a fruity aroma and balanced level of bitterness, with a delicate oaky finish. 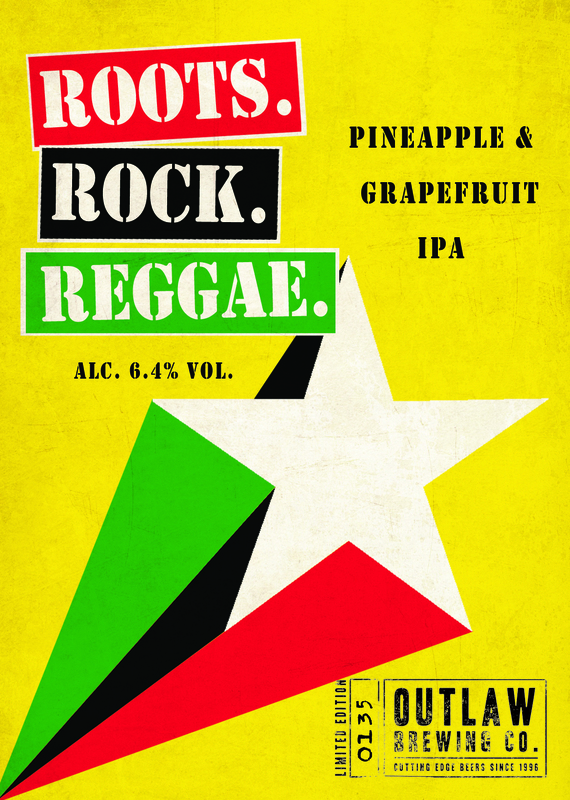 Get some reggae in your jeggae with this pineapple and grapefruit IPA that takes its name from the Bob Marley classic. One hundred grapefruits (zest and juice) and twenty-five pineapples (juiced and pureed) were sacrificed during the boil, with additional juice being added during fermentation and conditioning to create an india pale ale from another dimension. Admiral, Cascade, Summit and Nelson Sauvin hops compliment the tropical fruit flavours, before additions of Centennial and Nelson Sauvin were added during fermentation to enhance things further. The pineapple hits upfront, with the grapefruit then joining the party to compliment the hop characteristics, before delivering a citrus kick. 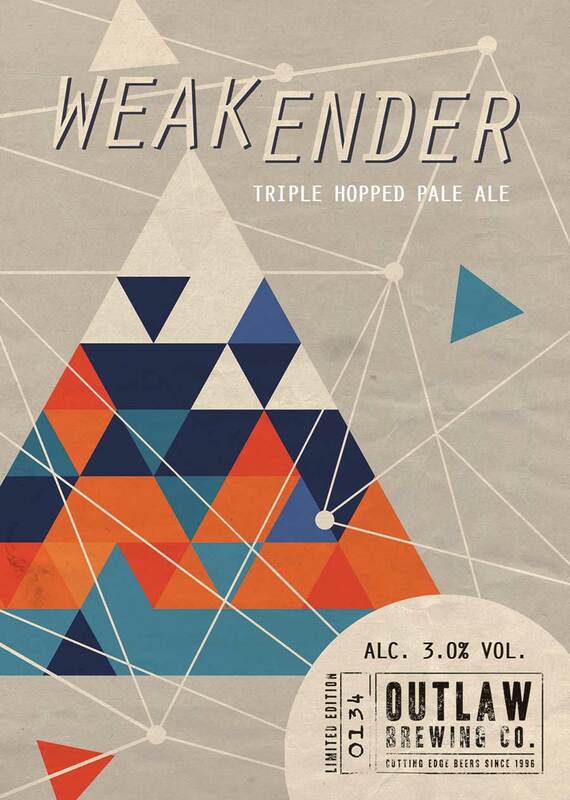 A fruity little number, Weakender is a triple-hopped pale ale brewed using Cascade, Crystal and Simcoe hops. At 3% you’d be mistaken for thinking this beer wouldn’t pack a punch, but it’s been hopped like an IPA. We kept the bitterness in check to make sure the beer remains balanced, but it carries the aromatic qualities you’d expect from something like a session IPA. There’s citrus fruit aplenty on the nose, with lemon, orange and lime all jostling for front and centre, as each hop shows its calibre. THE BEHEMOTH - ALC. 7.2% VOL. The OED defines a Behemoth as ‘a huge or monstrous creature or something enormous.’ With this in mind, having recently made some modifications to our mash tun, we’ve been able to brew our strongest (and hoppiest) beer to date. 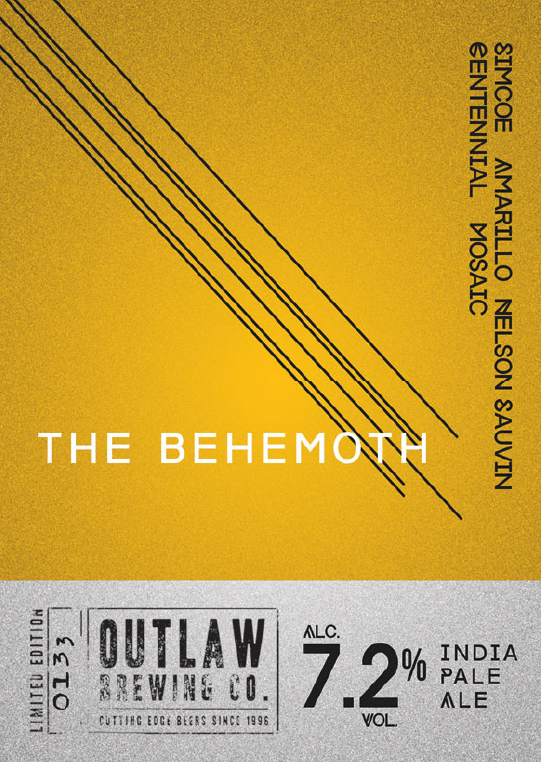 Brewed using five of the best hops that money can buy (if you’re lucky enough to get your hands on them, that is)*, The Behemoth is a 7.2% India Pale Ale. We’re not going to offer up any histrionics or tell you that this beer will change your life, that it can turn a sandwich into a banquet or that it will find that slipper that’s been at large under the chaise lounge for several weeks, but, put simply, we’re very proud of it and we’re confident that you’re going to like it too. *The hops in question are Simcoe, Centennial, Nelson Sauvin, Mosaic and Amarillo, which were added during the boil and during the latter stages of fermentation. FULL HOUSE - ALC. 6.2% VOL. The idea behind the beer was to create a single malt beer and layer flavours and aromas from six different hop varieties, chosen at random by a state of the art* bingo machine. There were 18 hop additions in total, taking place every five minutes during a 90-minute boil. Although the hop varieties and times were selected at random, we did allow ourselves some control by working out a matrix of every single combination of hop additions (of which there are lots!). As this is a commercially brewed beer, we wanted to ensure that the finished beer would be balanced. So, no matter what combination the machine threw out, the bitterness level of the beer would be the same. Only the flavours and aromas in the finished beer would differ, having been selected at random. The artwork was created by James Straffon. James is a talented artist based in London and we’re very grateful for the enthusiasm he showed when we approached him with this beer in mind. LOVE ALL THE PEOPLE - ALC. 4.7% VOL. 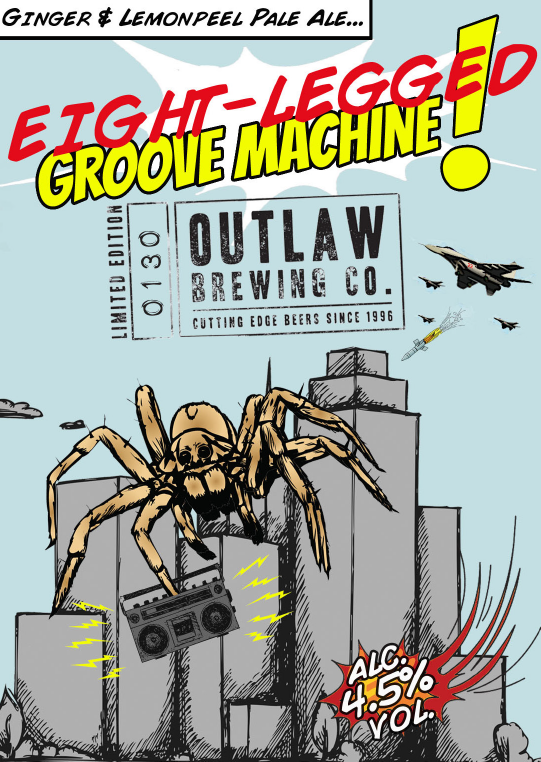 Hot on the heels of Eight Legged Groove Machine we’ve only gone a brewed another brand new beer. 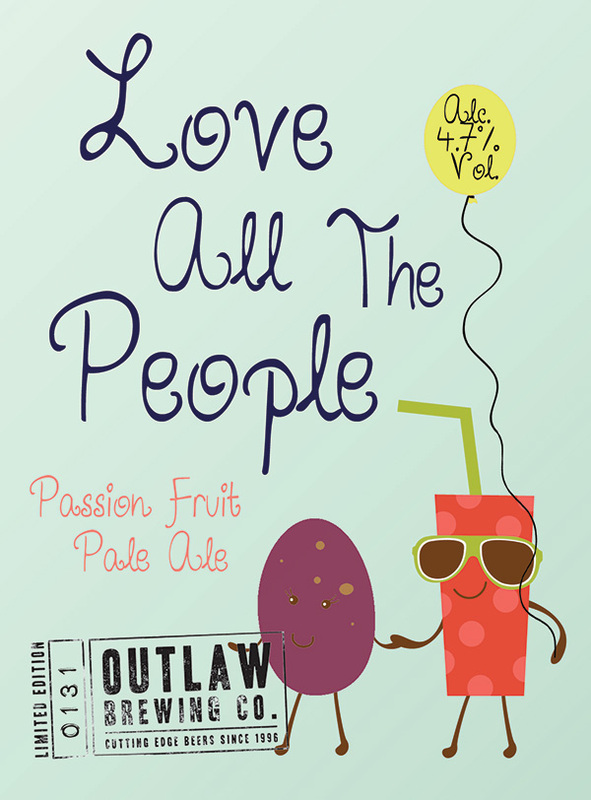 This time it’s a passion fruit pale ale called Love All The People. In addition to being infused with passion fruit, the beer also boasts the inclusion of three belting new world hops, which add soft tropical fruit notes. The hops in question are Galaxy, Mosaic and Simcoe. There’s ten (imaginary) bonus internet points up for grabs for anyone who tweets us (@OutlawBrewCo) with the name of the person Love All The People makes reference to. EIGHT-LEGGED GROOVE MACHINE - ALC. 4.5% VOL. Eight-Legged Groove Machine is a refreshing pale ale that’s been infused with ginger and lemon peel. Golden Promise pale malt provides the perfect backdrop for Cascade and Motueka hops to impart additional citrus notes and a quaffable level of bitterness. The beer takes its name from The Wonder Stuff”s 1988 debut album, with the artwork taking on a comic theme. We originally brewed a beer called Eight-Legged Groove Machine as a one-off cask (and a few cheeky bottles) on our pilot plant for Glyn Roberts, of Utobeer ‘fame’. This beer didn’t have either ginger or lemon peel in it, but we loved the artwork so much we decided to use it on a larger scale, once we came up with the recipe for the beer as it is now. We managed to get a bottle of the original beer into the hands of Miles Hunt, the singer and a founding member of The Wonder Stuff, which he was pretty chuffed about, so we’d like to think that it comes with his official stamp of approval. BABY-FACED ASSASSIN - ALC. 6.1% VOL. 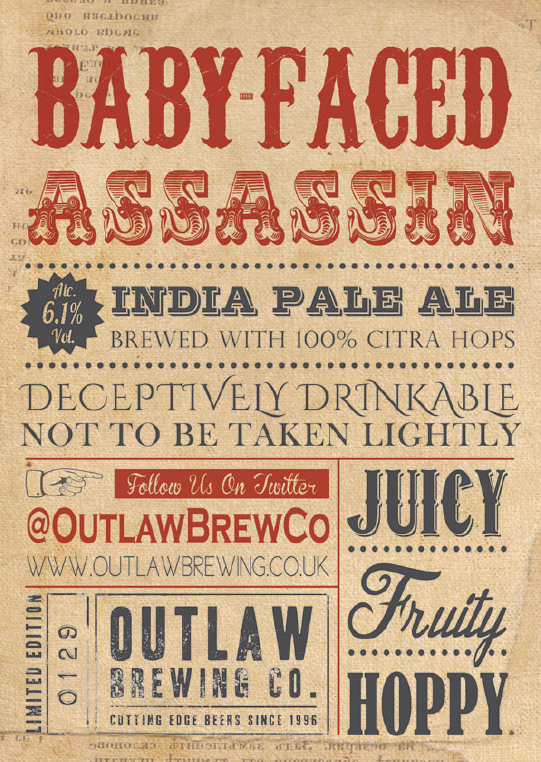 Baby-Faced Assassin was originally conceived as a recipe in the back office of Beer Ritz in Headingley, Leeds, on a dark winter’s afternoon in early 2011, before being brewed as a very small batch beer. Fast-forward nearly three years and we decided to brew the beer on a commercial scale for the first time. There’s no getting away from what this beer is and that’s a celebration of hops and, more specifically, one hop in particular; Citra. Grown in the Pacific north west of America, Citra has become one of the most sought-after hops in the world, since it first became available in 2007. The recipe’s been up-scaled and ever so slightly adjusted to a 20BBL brew length, whilst Simpson’s Golden Promise pale malt provides an ideal canvass upon which the characteristics of the hop can been displayed. Light and biscuity, it adds a touch of depth to the beer without getting in the way of the hops. Brewed with 100% Citra hops that create aromas of mango, apricot, grapefruit & mandarin orange, along with a lasting, juicy, tropical fruit bitterness, the Baby-Faced Assassin is a deceptively quaffable India Pale Ale that shouldn’t be taken lightly. The artwork for the beer has been designed by the chap who came up with the recipe and is a nod to the old musical hall bill posters of yesteryear, incorporating some old school and modern fonts along the way. Baby-Faced Assassin now forms part of Rooster’s core line-up in cask, keg and can. Low Life - Alc. 2.8% Vol. 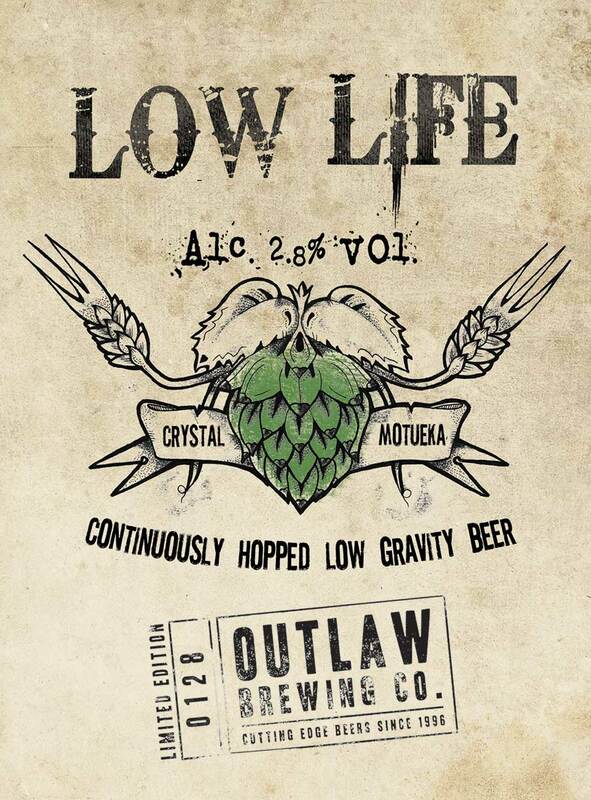 We challenged ourselves to brew something at the weaker end of the scale and came up with Low Life, a continuously hopped low gravity beer that weighs in at just 2.8%. We didn’t skimp on hops and took the decision to add them continuously during the boil, a technique pioneered by Dogfish Head that imparts a unique hop character to the beer, without being too over the top. The hops in question are Crystal from the US of A and New Zealand’s Motueka. We also added Crystal and Pacific Gem, during fermentation, which adds an extra dimension to the hop character of the beer. Five different malts were used in order to ensure that the beer had a good amount of balance to it, whilst they’ve also added a bit of extra colour to the beer. The artwork for Low Life comes courtesy of Daniel Vane, or GrandMaster Tash as he’s known on Twitter. Dan’s a self-confessed doodler, portrait artist, tattoo lover & Turner obsessive. He also sports a very impressive moustache. Not content with designing the artwork for us, Dan hopped on a train and headed north to join in with the brew day. 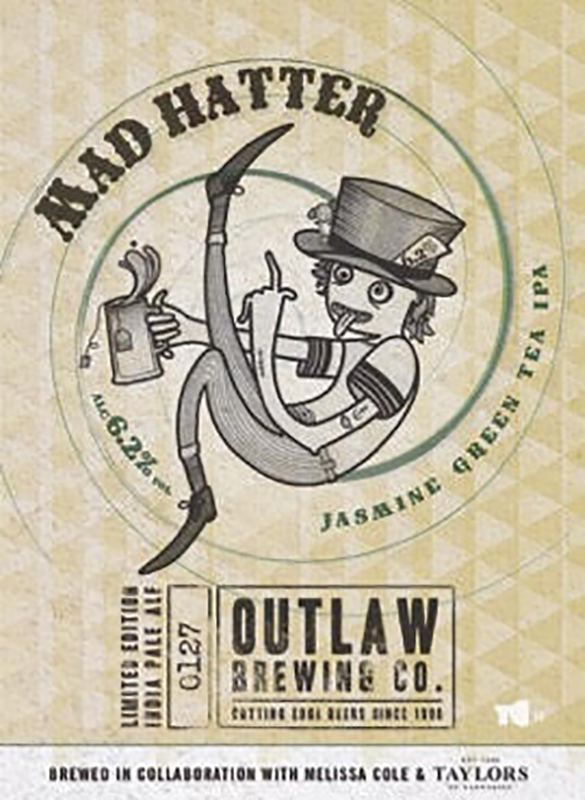 Mad Hatter – Alc. 6.2% Vol. The return of Outlaw Brewing Co. is something we’d been working towards for 12 months, with the aim of producing limited edition beers of varying abv’s and styles on a semi-regular basis. 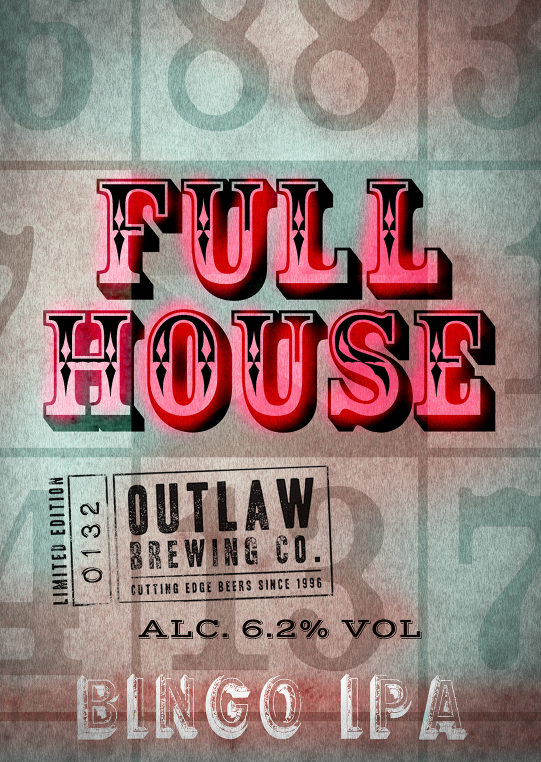 The first Outlaw beer was brewed in 1996 and, after a few years of inactivity, it’s back! We had various ideas about the type of beer we’d like to brew to celebrate the re-launch of the brand, but, when Melissa Cole, author of Let Me Tell You About Beer, asked us if we fancied brewing a beer with her at some point, we decided that such a collaboration was the right way to go and discussed the type of beer to brew and decided that it should definitely include a tea of some sort and, from there, Mad Hatter was born. At this point the collaboration turned into a double collaboration, as we’re fortunate enough to share our postcode with Taylors of Harrogate, an independent tea merchant whose warehouse is a stone’s throw from the Brewery and who really liked the idea and took the time to help us choose the perfect tea to use. We spent a morning with Ian Brabbin, Head of Tea, where we were shown how to slurp (slurp being the technical term for how to taste tea by slurping it from a spoon so that it’s sprayed all around the mouth to hit as many different taste buds as possible. Check out this video to see how the professionals do it!